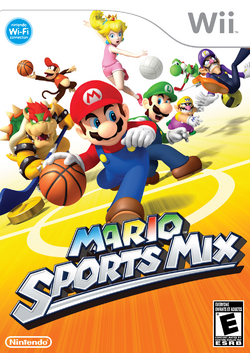 Mario Sports Mix is a Mario sports game for the Wii featuring Mario and company competing in four sports: hockey, basketball, dodgeball, and volleyball, along with the Final Fantasy characters who have appeared in Mario Hoops 3-on-3 as well. Slime, a Dragon Quest mascot, makes an appearance in this game. This game was developed by Square Enix, who also developed Mario Hoops 3-on-3. The game supported the Nintendo Wi-Fi Connection feature, which enables players to play with other players in their region. To save any game data, three blocks of memory have to be used on the Wii system. However, due to the game's Wi-Fi compatibilities, the game data is copy protected, which means it cannot be transferred onto other Wii systems. As of May 20th 2014, Nintendo has terminated the Nintendo Wi-Fi Connection service, meaning that it is no longer possible to play Mario Sports Mix online. The scene where Toad witnesses the sight of a mysterious, blazing comet falling into the Mushroom Kingdom. The discovery of the Sports Crystals lead to the events in the game. When the players' team wins the Mushroom and Flower Cups, and gets to the end of the Star Cup, everything seems to be normal. However, in the final round, a Star Ship appears and the players' opponent turns out to be Ninja in disguise. Ninja steals the trophy and jumps onto the Star Ship, which prompts the players to follow Ninja to get the trophy back. They end up playing against the Final Fantasy team, while the Star Ship flies through space. When the players win against the Final Fantasy team, they receive one of the crystals that fell from the sky. The leader of the team then uses it to power the Star Ship and take the team back home. After players receive all four crystals, the crystals merge and turn into a dark, glowing crystal. The dark crystal takes the players to another area. In this area, players encounter the Behemoth, a creature from the Final Fantasy series. The players must defeat the monster before it defeats them. When the players defeat Behemoth, the dark energy from the dark crystal disappears and turns into a rainbow-colored crystal. The players use the crystal again to power the Star Ship to take them back home. Sports Mix mode's story is highly identical, except after the players' team defeats the Final Fantasy team, the three Sports Mix trophies that they receive will end up merging into a dark crystal. That crystal also leads them to an alternate dimension, where the Behemoth King is found. Similarly with Behemoth, players have to defeat the Behemoth King before it takes them out. When the Behemoth King is defeated, the crystal's dark energy disappears, and it turns back into a rainbow crystal. The players use that crystal to power the Star Ship to take them back home. Toad and Yoshi defeat Ninja and White Mage in a 2-on-2 Volleyball match. White Mage, Pink Yoshi, and Toad defeat Ninja, Pure White Mage, and Black Mage in a 3-on-3 Dodgeball match. Mario Sports Mix features four playable sports, all unique from each other. Players can play either alone with CPU allies, cooperatively with others up to three players, or against one another. Four players can participate; however, they can participate only in Vs. mode since it is impossible to have all four players team up. The Wii Remote and Nunchuk control style is used as the primary control scheme for the game. However, the players can also use the Wii Remote in the horizontal position. Players are able to perform actions through shaking the Wii Remote and/or inputting buttons as shown in horizontal Wii Remote scheme. All sports are played in periods, where, except for volleyball, there is a certain time limit to each period. When the time limit reaches zero, players move to the next period and change sides. Excluding dodgeball, points acquired in past periods also add up to the current game's total score. In dodgeball, another period commences when all team players get knocked out.
? Panels return from Mario Hoops 3-on-3, where they serve the same purpose: to provide players with either coins or an item. Unlike Mario Hoops 3-on-3, items are held in reserve rather than players holding them. The more coins players have, the more points they can get when they achieve a scoring. Players lose coins when they get hit by an opposing item, which makes the coins scatter on the floor. However, in dodgeball, coins increase the attack power of attacks, and players cannot lose coins from items. There are also special options that can be adjusted for each sport in exhibition mode, such as turning on and off ? Panels, setting the number of periods and the time limit, and other options which can be specific for each sport. Once the options are set, they do not reset whenever a players turns off the game. On a side note, there's an option which enables the players to receive commands. However, this option is available only when the CPU level is set to "Easy". Basketball plays in a similar fashion as in Mario Hoops 3-on-3, but with a few minor changes. Basketball is played in a similar fashion as in Mario Hoops 3-on-3. Players must score points by shooting a basketball into their hoop in order to win the game. Whichever team has the most points after all periods wins the match. Two points are acquired when the ball makes it in the hoop; three points are acquired when the ball gets shot from the three pointer and beyond or when a special shot is performed. The coins that the players gather along the way are added to their total score. Also in this sport, which is exclusive to this game, there is a shot clock on the bottom-left hand corner of the screen so the characters can shoot within the time limit, just like in a professional NBA game. If they do not shoot before time runs out, the other team gets possession. Players are also able to defend, block, and make dunks in this game in a similar way to the actual sport. If the score is tied at the end of regulation, then overtime will begin. With overtime in this sport, no game ends in a draw. Volleyball is played by hitting a ball without making it touch the ground. Players first start matches by serving the ball, either by ground or by air. The match then proceeds, while the players try to smack the volleyball so it touches the ground. If that occurs, the last team to successfully hit the ball over the net gains a point. When a point limit is reached (the default is fifteen points), the set is won. Players can spike the ball, deflect a spike, and use many other moves that bear resemblance to the actual game. Volleyball also has an out zone, much like tennis: any player who hits the ball into this zone forfeits a point to the opposing team. Volleyball is the only sport in the game that can never have a time limit. A Dodgeball game always begins with a jump-ball that is done by Lakitu to determine which team gets to attack first. Dodgeball is mostly played by throwing a ball to the opposing team. There are two teams of two or three characters and a colored Yoshi on the players' teams. Players can prevent a hit by catching the ball. Players who fail to catch the ball or dodge it will lose their vitality. They can prevent this if they catch the ball before it hits the ground, especially if the ball flies upwards. Players cannot catch the ball if they are facing away from them, nor can they catch it if an item is in effect. Players have a Health Meter and lose a portion when they get hit, except for the colored Yoshi, who can never be "knocked out," but cannot leave the box at the back of the court. Players cannot control the Yoshis, unless they encounter the ball, and even then, the only commands that the players can give them is to pass or attack. If players lose all their HP, they are out, and they are sent into their box. However, unlike the Yoshis in the box, they can leave if they damage their target with the ball. Players that do this also get a small amount of their HP regained, but are out immediately if damaged again. However, some alternate route objectives do prevent players who are out from leaving the box; this can also be applied to exhibition matches in the settings. The first team to knock out the opposing team before the time limit expires wins the set. Additionally, the team who has the most number of remaining players automatically wins when time runs out. If both teams have the same number of players remaining at the end of the time limit, sudden death follows. With this term, no set ends in a draw. In sudden death, the first team to take damage loses the set. On a side note, this is the only sport which has a time limit in which players can set the timer to infinite. A hockey game always begins with a face-off that is done by Lakitu to determine which team will get the puck at the start of the period. If a team scores a goal or a special shot, another face-off will take place. The goalkeepers in this sport are Shy Guys, and their color depends on which team they are in. In order to steal the puck, players must tackle each other, which can be achieved by the motion of shaking the ( in sideways mode) or simply by making a character go in front of the opponent with the puck. Sometimes, a struggle ensues and players must shake their Wii Remote the fastest that they can in order to win the puck over and knock the opponents away. The team with the most points wins and, very much like basketball, this game is played in time limits and transitional periods. This sport uses a Hockey Stick. Sports Mix is a tournament-only game mode, which uses all of the sports. To unlock it, players must complete all four Star Cups and defeat Behemoth. In this game mode, the sport that is played is chosen randomly for each round. Computer controlled characters are set on the Expert difficulty level, the hardest difficulty level in the game. When the players beat the Star Cup, they fight the Behemoth King, instead of the normal Behemoth. The Behemoth King has more health than Behemoth and is harder to beat. Players can select only characters and costumes that are unlocked in all four sports. For example, if players unlock Cactuar for Basketball, Hockey, and Volleyball, but not for Dodgeball, it cannot be selected in Sports Mix mode. If players unlock Cactuar for Dodgeball as well, it can be selected in Sports Mix mode. In a similar manner, recolors cannot be used unless they are unlocked for all four sports as well. Each sport utilizes various controls, depending on the control scheme that the players use. This only works if the player's teammates are CPU players. This only works if the players' teammates are CPU players. while jumping. Shaking the Wii Remote while jumping. button while running near the basket. Shaking the Wii Remote while running near the basket. Holding and releasing when the players' team has the ball. Holding and releasing when the players' team has the ball. Blocking for an extended time period. Blocking for an extended time period. button while blocking. Shaking the Wii Remote while blocking. Jump Toss: then Overhand: Swinging the Wii Remote up. Underhand: Swinging the Wii Remote down. Jump Toss: + swinging the Wii Remote. On the third hit, . If Auto Jump is ON, this command will execute immediately before a spike. . On the third hit, shaking the Wii Remote. If Auto Jump is ON, this command will execute immediately before a spike. Spiking after charging at the landing marker. Spiking after charging at the landing marker. to move the landing cursor. to move the landing cursor. while jumping. button then shaking the Wii Remote. Holding and then releasing the button when the players' team has the ball. Holding and then releasing the button when the players' team has the ball. This only works if the player's teammates are CPU players. This only works if the player's teammates are CPU players. While running near the center line, when the charge is full. While running near the center line, shaking the Wii Remote when the charge is full. Running to the center line to jump. During that time, button to attack. Running to the center line to jump. During that time, shaking the Wii Remote to attack. is used to direct the pass on 3-player teams. is used to direct the pass on 3-player teams. Shaking the Wii Remote then shaking the Wii Remote. then shaking the Wii Remote. Holding and then releasing when the players' team has the ball. Holding and then releasing when the players' team has the ball.
. Some characters repel the dodgeball instead of evading it; those kinds of moves have no effect against item attacks. Shaking the Wii Remote. Some characters repel the dodgeball instead of evading it; those kinds of moves have no effect against item attacks. This move has no effect against item attacks. + This move has no effect against item attacks. button before the dodgeball touches the ground. Shaking the Wii Remote before the dodgeball touches the ground. Shaking the Wii Remote. Shaking the Wii Remote. in the opposite direction. in the opposite direction. This only works if the players' teammates are CPU players. This only works if the players' teammates are CPU players. ; to adjust the aiming direction. ; to adjust the aiming direction. Releasing after charging. Shaking the Wii Remote after charging. Holding and releasing when the players' team has the puck. Holding and releasing when the players' team has the puck. button. A more powerful check is performed when players check three times in a row. Shaking the Wii Remote. A more powerful check is performed when players check three times in a row. button when the opponent shoots. button when the opponent shoots. This only works if the player's teammates are CPU players. button. This only works if the player's teammates are CPU players. button to charge and releasing to attack. button to charge and releasing it to attack. button while holding a meteor and running near Behemoth's head. Shaking the Wii Remote while holding a meteor and running near Behemoth's head. while holding a meteor to pass to teammates. The teammates treat the meteor as a volleyball. while holding a meteor to pass to teammates. The teammates treat the meteor as a volleyball. button. All characters do this move, regardless of defensive maneuvers in dodgeball. Shaking the Wii Remote. All characters do this move, regardless of defensive maneuvers in dodgeball. All-around - All-around characters have average Power, Speed, and Technique. They generally are not weak at any stats, but they are not strong in any either. Technical - Technical characters have more Technique, but less Speed and Power. These characters can better aim their shots. Powerful - Powerful characters have more Power, but less Speed and Technique. These characters have stronger and faster attacks and shots. Speedy - Speedy characters have more Speed, but less Power and Technique. These characters can move faster over the ground. Tricky - Tricky characters have one stronger stat, but the others are usually very low. However, they do have some useful, but tricky moves. As Mario Hoops 3-on-3, this game is shown to make use of character specific abilities. Prior to using these abilities, there is a meter that needs to be filled (shown on the bottom left and right corners of the gameplay screen). These abilities in question can allow the characters to unleash a powerful move in the variety of sports in the game that can help the players win a game. Each special ability is unique to each character and these moves tend to vary from the sport that players are playing. Finally, the playable characters have their own stat values, which depict their strengths and weaknesses. For the respective charts shown below on this article, the stat values for each playable character are out of 5. The Final Fantasy characters from Mario Hoops 3-on-3 make a return in this game. Additionally, the Dragon Quest character Slime makes an appearance, previously having appeared alongside other Mario characters in Itadaki Street DS. These characters are all unlockable and also the only unlockable characters of the game. Characters who are unlocked by playing a certain number of matches or by clearing secret missions in Tournament mode, can only be used in the sports that they are unlocked in. However, characters who are unlocked by clearing Star Road can be used for all sports. For the characters that are unlocked by playing a certain number of matches, including Wi-Fi matches, the players are not required to win every match. Also, when the players cleared the Star Road, but already has unlocked the character for all sports in a different way, the players gets the next character instead. For example, if players have already unlocked White Mage for every sport, and then clears the Star Road for the 2nd time, they unlock Black Mage for every sport instead. Ninja, White Mage, and Black Mage never appear as CPU opponents at normal tournaments, except for the Star Cup finals. However, they can appear when players are taking alternate routes. Ninja makes two copies of himself that go for the goal. The two copies are simply illusions and do not count for a point, but if the actual Ninja scores, he and his team gets a point. In dodgeball, if his copies hits opponents, they lose a section of their HP despite the copies being illusions. The players should clear Star Road once. White Mage aims her goal using a different aiming circle than any other character in the game, proceeded by a shot, which is a blast of light. Any player that gets hit by the blast gets pushed back and loses a section of their HP in dodgeball. In volleyball, the ball will land in a random location, making it trickier to know where the shot will land. The players should clear Star Road twice. The players should clear a certain Mushroom Cup mission. The players should win the Flower Cup 4 times. Black Mage waves his wand and uses lightning to shrink nearby opponents, as if they consumed a Mini Mushroom. He then sends the ball or puck into the location of his aim. Opponents remain tiny for the duration of the move before returning to normal. In Dodgeball, players can dodge roll to avoid the lightning. The players should clear Star Road thrice. The players should win the Star Cup 4 times. Slime sends copies of itself into the court. The Slime copies stun any character they touch and they appear to follow the characters. The players should play 28 matches in one sport. The players should clear a certain Flower Cup mission. When Moogle throws the ball or puck, the ball disappears briefly, and then reappears at a different spot, which could throw off other players. The players should clear the Mushroom Cup. Cactuar fires needles that can hinder the players' movements (players are briefly immobilized at times). The players should play 60 matches in one sport. The players should clear a certain Star Cup mission. Blue Toad has been unlocked for Dodgeball. Certain characters have alternate colors that can be unlocked by performing certain objectives. Alternate colors can be used only in the sports that they are unlocked in, but colors unlocked by clearing Star Road can be used for all sports. To scroll through colors, the players can press the button on the Wii Remote, regardless of the control scheme used. In tournaments, it is possible for the CPU team to use more than one of a certain character, which is not possible for the players' team, nor in exhibition matches. Likewise, if the players' team contains a character who has an alternate color, the CPU team can still use that character's unused colors in tournaments; for example, if the players' team contains Yoshi, it is still possible to see a different color Yoshi in a CPU team. CPUs can use alternate colors of characters even if the player has not unlocked them yet. 20 matches as Ninja. Shadow White Ninja mission at the Flower Cup. Star Road cleared 4 times. 20 matches as White Mage. Pure White Mage mission at the Flower Cup. Star Road cleared 5 times. 20 matches as Black Mage. Magic Red Black Mage mission at the Star Cup. Star Road cleared 6 times. There are fourteen playable courts in Mario Sports Mix. Courts in this game are often based on the courts from Mario Hoops 3-on-3, some of them even directly return with a slight redesign. Each cup holds three courts that can be played depending on the sport. There are also three extra courts, which do not appear in normal tournaments. They can be unlocked by playing many games or completing missions in Tournament mode. There are also two courts in each sport that cannot be played in whatsoever, the exception being Volleyball, which has one unplayable court, and Daisy Garden, which can only be played in the Flower Cup while taking an alternate route. Some courts must be unlocked before the players can play on them. The way to unlock these courts differs per sport. Normal courts can be unlocked by simply playing on them in Tournement mode. Extra courts can also be unlocked by playing on them in Tournament mode, but the Extra courts only appear in the Alternate routes. It is also possible to unlock courts by playing a certain number of matches in Tournament or Exhibition mode. The player does not necessarily need to win matches. As in most Mario games, there are items available during the gameplay of Mario Sports Mix. These items are available by touching the available and various ? Panels on the court. Most of these items can struck players to make them lose coins, and all items also affect teammates as well. A single banana is thrown into the court. The bananas can make players slip and fall, which stuns them for a brief amount of time. Bananas can also be used to block incoming shells. When players use the item in conjunction with the ball/puck, the ball/puck makes a homing, wide curve and can hit anyone with the same effects of a banana. A bob-omb is thrown correspondingly to the user's aim. When the bomb lands, it explodes, knocking any player caught in the blast radius. Bob-ombs also obliterate items in its radius. A mini-game, Bob-omb Dodge, has a sole purpose of tossing Bob-ombs of various sizes at players, who must dodge these bombs. Though not an offensive weapon, unlike all other items listed, coins play a vital role in Mario Sports Mix and serve as a puck in hockey, although the latter role is not associated with its sole purpose. Coins are mainly collected by running on ? Panels, but are also obtainable by stage hazards or by stealing them from other players via offensive items. Coins increase the score output and how much damage is done to players in dodgeball. Coins get depleted into points once players score or hurt players in dodgeball, which means that players must collect coins again if they want to score more points. A maximum of 10 coins can be collected at a time. Similar to its function in the Mario Kart series, Green Shells move in a straight line and bounce off any wall. They get destroyed by any other item in play and disappear when they hit another player or bounce in the wall enough times. When used in conjunction with the ball/puck, this item homes towards its goal and can hit any player in its way, however stopping the ball/puck momentum. The Mini Mushroom shrinks any players it comes in contact with. Except when used in conjunction with the ball/puck, the Mini Mushroom behaves quite similarly to the Banana; they both get lobbed and both remain in one spot. Any player turned mini cannot perform most moves and gets movement lowered. The Mini Mushroom's effects revert over time. Much like the Green Shell, the Red Shell functions not too different than its counterpart in the Mario Kart series. The Red Shell homes after its nearby opponent. When contact is initiated, the player gets knocked in the same manner as a Green Shell. Red Shells do not rebound off walls and can get destroyed by another item. When used in conjunction with the ball/puck, the Red Shell does a large curve and homes for the goal. When in this form, the Red Shell can knock other players away, but this stops the momentum of the ball/puck, much like the Green Shell. Not too different than its functions in other various games, the Super Star makes players invincible. Unlike all other items, this item can be obtained very rarely, most likely to the losing team. When this item is collected, it automatically activates itself. The Super Star not only makes players invincible, it also powers up the ball/puck, making it impervious to other player attacks while flying through the players, homing to the goal and moving at a much faster speed. In the Behemoth battle, players can also collect Meteorites from ? Panels. Meteorites can be used in different ways; they can be thrown at Behemoth to damage it (like in Dodgeball). Players can also "dunk" it at Behemoth (like in Basketball). They can also pass the Meteorite at another teammate. Players must receive it and pass it to another player (Volleyball). By doing this, the SP Bar fills marginally, and the meteorite gains power. Coins can also be collected from ? Panels to give it more power. When the SP Bar is full, and all the players of the team are still in the game, the players can use a Special Shot. This can give Behemoth significant damage. When the meteorite falls on the ground, it and its power disappears; players must collect a new meteorite and recharge it. Mario Sports Mix has two game modes for each one of the four sports: Exhibition and Tournament. Each sport also has a tutorial video so that players can learn how to play these sports. Players can select which court to play during a dodgeball match in Exhibition mode. Before a match starts, a VS screen will be shown to let players know which two teams are involved. Exhibition mode allows players to play any one of the four sports and customize the rules of the match from the court selection screen at anytime before the match begins (see Gameplay for more info). From there, players can select any four or six of the nineteen playable characters and one of the fourteen compatible courts. Players may unlock characters or courts by playing games in this mode. Character skins can be unlocked by playing with a particular character certain times. This also counts for Tournament mode. However, what players unlock can only be used in that sport. So if players unlock Slime for Hockey, Slime can only be used in that sport. The Volleyball Mushroom Cup Tournament. In Tournament mode, players can compete for the trophy in the same manner as in Mario Hoops 3-on-3. There are three rounds in the tournament. When players win a game, they move on to the next round of the tournament. Each time players win a cup, they can earn one of the three small crystals that corresponds to the sport's color and the players moves on to the next tournament. If all three cups are cleared for that corresponding sport, then it becomes a Sports Crystal that is placed on the Star Ship. The player also gets to watch the credits for Mario Sports Mix each time a Sports Crystal is earned, and alongside the credits is a video of that sport being played. After winning the Star Cup of a sport, players unlock a Hard mode for that sport. Opponents are more difficult than in Normal mode. Also, if players clear the Star Cup at all sports, they receive all four Sports Crystals to power the starship. After collecting all four large crystals, they battle Behemoth and defeat Behemoth. Sports Mix mode is unlocked when this is cleared. Sports Mix only has one skill level, which is Expert, and it is a tournament in which each match is a randomly generated sport. Also, clearing the Star Cup in Sports Mix mode makes players face off against the Behemoth King. Descriptions are from the NTSC version. Normal: "Enjoy a standard tournament as you take on increasingly difficult opponents in each round!" Hard: "Test your skills in a more challenging tournament against advanced opponents." Expert: "Now your opponents are getting serious! The sport changes with each round, so get ready!" Mario on an alternate route; Green Toad can be seen. Players can also replay tournaments to find alternate routes, but they must clear the tournament the first time in order to do so. Players can take the alternate route once completing the first round. Then, in the second round, arrows will appear. One arrow will take the players to the alternate route, while the other will keep them on the normal route. In the alternate routes, players do not play normal matches, but missions instead. If players lose a mission, they get sent back to the normal tournament. If players win a mission, they may continue on, but the road often splits. Players may choose which way they want to go. These roads lead players to different missions, different events, or sometimes even back to the normal tournament. Once players come back to the normal tournament, they cannot re-enter the alternate routes until they start over the tournament. Taking right choices or guesses, players may reach the Hidden Final. The Hidden Final is the last mission of the tournament. If players lose this mission, they do not get sent back to the normal tournament, but they can retry the mission instead. If players win this mission, they earn the tournament cup, just like players do in the normal run. The Hidden Final involves completing a task that is usually more difficult than the others, for example, winning a match without allowing the opponent to score even once. Players may unlock hidden characters, courts, or character skins by winning missions. However what they unlock depends on the mission, the sport, and even the routes they took before reaching the mission. Unlocked items are only accessible in the sport players win the mission in. Alternate routes in the Star Cup are slightly different compared to the Mushroom and Flower Cups. If players win some missions in the route, they can travel to the Star Road. If players manage to reach the end of the Star Road, they get a message Star Road Complete!, and travel back to the normal tournament by jumping on the Star. Unlike the Mushroom Cup and the Flower Cup, there is no Hidden Final for the Star Cup. Instead, after clearing the Star Road, players immediately go up against the Final Fantasy team. Unlike with the normal tournament, however, crystals do pop up during the match; the crystals act like coins, which add extra points for Basketball, Volleyball, and Hockey, while strengthening attacks in Dodgeball. When completing sports in Tournament mode, some items in menus of the game change. Once a sport is completed in Normal mode, a crystal marks the sport in the record menu. When the sport is completed in Hard mode, the ball (or in case of Hockey, the stick since the coin is already gold) turns gold in the main menu. If Sports Mix mode is cleared, the usual blue background of the main menu turns into a gold-red colored background. The effects of the background changing to a goldish-red and the effects of the ball (or stick in hockey) are also used if the Unlock everything glitch is performed. One of the four party games, Feed Petey. In addition to the tournament and the exhibition modes, Mario Sports Mix has four party games, one for each sport. They can be played for up to four players. All Party games have at least two levels. The top five character picks for one sport. The top five stage picks for one sport. Wii Alex Navarro, Giant Bomb 2/5 "Mario Sports Mix simply comes across like a bizarre copy of a copy. It's a fax-machine quality retread of such startling inanity that, at a point, you might actually find your fond memories of Mario sports games past overwritten by this blur of dispassionate mediocrity. We're a long way from the days of great games like Mario Tennis and Mario Golf, and with each progressively lamer franchise installment Nintendo thrusts upon us, that divide just continues to widen.'" Wii Keza MacDonald, Eurogamer 7/10 "As a whole package, this isn't quite up to the standard you'd hope for from Mario Sports, but it certainly doesn't damage the series' reputation." Wii Peter Willington, Cubed3 7/10 "Mario Sports Mix is a solid title but by no means is it astounding. It lacks the focus or complexity of a Toadstool Tournament or Power Tennis, opting instead for a more casual focused crowd that want a bit more than Wii Sports Resort can offer. Fun? Yes. Lasting fun? Not so much." For a complete list of media for this subject, see List of Mario Sports Mix media. Title Screen/File Select - Title Screen/File Select screen theme. Choose Sport - Choose Sport screen theme. For this subject's image gallery, see Gallery:Mario Sports Mix. In the pre-final version of the game, the Health Meter in dodgeball was originally going to be split up into four sections, just like the health meter in the Super Mario Galaxy series that is divided into three sections. In the final version it is a meter with one section that depletes correspondingly. There was also a different logo shown at E3 2010. Also, the numbers, placement of bars and other text aesthetics have been altered from the final version. In Dodgeball, after a special shot is done or while a player is going out, the "charge" sound is heard and the victory animation displayed if the player manages to catch the ball before it K.O's a team member. The English translation for the PAL versions of the game is slightly different from the North American version. The All-around type is called All-rounder in the PAL version of the game. The function of the button in the Select Character screen is called Variation in the Australian and European version. However, it is called Change Color in the North American version. When players get to the Select Court screen, the Australian and European version says Select Court. In the North American version, it is called Select Stage. Because of the difference between British English and American English, some words are spelled differently. Depending on the sport and when the team scores or when the match ends, a different message will appear on the screen depending on the version (Example: Game Set! (Japan) / Good Game! (North America)). Mario Bros.: One part of the menu theme is the sound effect of losing a life from this game. Super Mario Bros.: The underwater theme is one of the tunes available in Harmony Hustle. Also, sound effects are reused. Super Mario Bros. 2: The animation used for Toad whenever he throws an item appears to be influenced by how he threw vegetables and other items in this game. Additionally, Toad's classification as a speedy character could reference the fact that he is the fastest character in Super Mario Bros. 2. His blue outfit from this game is also used. Super Mario Bros. 3: In the underwater theme in Harmony Hustle, part of this game's underwater melody can be heard. Super Mario World: The athletic theme is one of the tunes available in Harmony Hustle. Mario Tennis: Peach and Daisy's alternate costumes, called "tennis-wear", is based off this series. More specifically, the design overall is based on the outfits that Peach and Daisy wear for Mario Golf: Toadstool Tour and Mario Power Tennis. Mario Kart: Double Dash!! : Lakitu holding up the ball with a plunger is a reference to when he holds up a sideways traffic light before the intro of the game plays. Mario Hoops 3-on-3: Much of the gameplay mechanics come from this game, especially in basketball. Most stages are also based off this game. The theme of Bloocheep Sea makes a return as one of the songs in Harmony Hustle. Also, in most of the sports selection song, there is the sound of the main theme of this game. New Super Mario Bros.: The design and function of the Mini Mushroom is based off this game. It also has this effect (briefly) in Black Mage's special shot. Luigi's Mansion: A court takes place in a mansion based off this game. The Poltergust 3000 appears as Luigi's special shot. Super Smash Bros.: Donkey Kong has a defensive, spinning move that strongly resembles his Spinning Kong move from the Super Smash Bros. series. Super Smash Bros. Melee: The Green Missile makes an appearance as Luigi's dive in volleyball and dodgeball, and his third consecutive check in hockey. Luigi's dash attack also appears to have been referenced as one of his attacks in basketball, his spike in volleyball, and his second consecutive check in hockey. Also, Bowser's Whirling Fortress move returns as his defense in volleyball. Mario & Sonic at the Olympic Winter Games: The gameplay in Hockey is similar to Ice Hockey from this game. Mario Kart DS: The concept of Waluigi owning a pinball-themed course returns. Mario Kart Wii: In Toad Park, Toads can be seen driving Mario Kart Wii-styled karts. Some item images are also borrowed from this game, such as the Green Shells. The game's title screen with all four sports. The Hockey sport in this game is presented as Ice Hockey. However, on every court except Mario Stadium, the characters play Roller Hockey instead. In most countries, the name Hockey is generally used for Field Hockey. However, this variant of Hockey is not playable in Mario Sports Mix. Donkey Kong, Bowser Jr., Daisy, and Toad are the only playable Mario characters to not appear on the box art and the title screen. Peach is also the only character who appears on the box art and title screen that has a different artwork. If a player stands next to the goalie in Hockey, the Shy Guy will sometimes whack the player with its stick for no reason. The Shy Guy can also hit Dry Bones in Ghoulish Galleon. ↑ 10 Wii games coming to Japanese Wii U eShop over coming weeks, with My Nintendo discount. NintendoEverything. Retrieved July 21, 2016. This page was last edited on April 13, 2019, at 23:36.